Hispanic Heritage Month is here and to celebrate we are highlighting Hispanic history, people, and culture from the Bay Area all month! 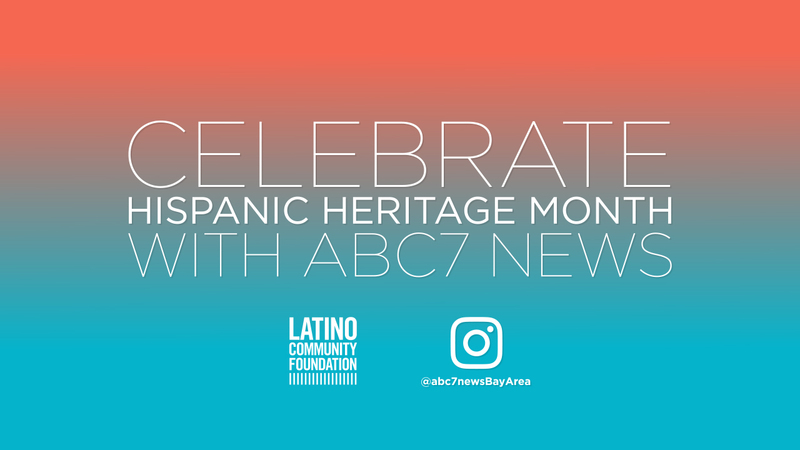 ABC7 is proud to partner with the Latino Community Foundation (LCF) to celebrate the Bay Area's rich cultural diversity. To learn more about how LCF is supporting nonprofits in the Bay Area and all over California, click here. On average, only 5.3% of tech employees are Hispanic in the United States. Leo Sosa wanted to close the tech gap that is keeping so many Latinos out of the field. He told us, "I always saw young people on the streets just hanging out, not doing anything and I felt like hey you know they might know how to create a website; they might know how to take a computer apart." So in February of 2017, he created the organization Dev/Mission to provide students mentorship and support from local tech leaders from across the Bay Area, such as Google, Twitter, Microsoft, Uber, LinkedIn, and Dropbox. Leo's goal is to create the next generation of tech talent - and he's already seen success! One former student now works at Google, and another is at Twitter! Our thanks to Leo Sosa for creating brighter futures for so many. Photos courtesy of Leo Sosa and Dev/Misison. When you think of the holidays in Puerto Rico, you think of arroz con gandules. It's a dish made with rice and pigeon peas that's a favorite in the island. Eric Rivera, owner of Borinquen Soul, missed it so much that he asked him mom to teach him how to cook it and then opened up a Puerto Rican restaurant in Oakland. His cooking has a lot of fans. The Oakland A's hire him to cater pregame meals for the players. "As a Latina ballet dancer, I always feel right at home with the companies I perform with, especially here at San Francisco Ballet, where I rehearse with many Spanish-speaking artists. I've been fortunate to work with people I look up to, such as ballet masters from Colombia and dancers like Dores André who is from Spain. I originally came to the US from Yucatán because the Mexican government gave me a scholarship to attend the School of American Ballet in New York City. After that, I spent 6 years at Miami City Ballet where my two role models were Patricia and Jeanette Delgado, two Cuban American dancers. I'm grateful that my Hispanic heritage gives me a connection to artists from around the world. All of them are so friendly, and I'm proud to be part of a community that shares a bond across borders." Join us in applauding Gabriela's dedication to her heritage and her art with a virtual "standing ovation"! Brava! Photos courtesy of Jeremy Charles. When my mother and I crossed the Mexican border in 1993, we had no family in the U.S. All we had was hope for a better life. So I know firsthand how important it is to have access to affordable health care, especially for those that are poor, undocumented or who do not speak the English language. I began my career at Center for Elders' Independence (CEI) in 2006 as a bus driver. I was privileged to interact with elderly and disabled patients and their families on a daily basis, where I was able to form relationships with them. Those relationships enabled me to learn how vital local organizations were for them. I now serve as the Bilingual Spanish/English Associate Account Manager at CEI. I worked my way up the ladder at CEI, consistently encouraged and inspired by my colleagues. I developed a desire to learn how to better assist the public in obtaining affordable medical care, and receive quality services, while helping them restore their independence along the way - especially for my Latino community. My frontline experience, combined with being raised in the barrios of East Oakland, has given me the passion to remain in the healthcare field for fifteen years. The constant budget cuts to MediCal, the continued threats to end the Affordable Care Act, and the immigration raids at County hospitals, have made me more dedicated to remain in this profession to find ways to improve the lives of the elderly and the disabled who are of low income. Keep up the great work, Luis! Photos courtesy of Center for Elders' Independence. LatinBayArea.com is your destination for all Latino events, covering food, music and community news. The owner, Mario Cruz, started the website over a year ago, for 3 reasons: 1) To empower the Latino community; 2) There are no Latino weeklies in the U.S. (he created the first one! ); 3) To show the beauty of Latino culture. His dream is to scale LatinBayArea.com into the top 10 U.S. markets, and to do the same for the African-American community. LatinBayArea.com is currently the largest weekly Latino email newsletter in the Bay Area with 18,000 subscribers and the largest Latino calendar of events, as well. Having been born in the San Francisco Mission District, he has an appreciation for all Latin American cultures. He enjoys displaying community stories, for example highlighting people and organizations, STEM, culture and history, family and free events, arts, discussions, classes, health and other resources. His life gurus are Dolores Huerta and Cesar Chavez, Martin Luther King, Jr., Mother Theresa, and Ghandi. Thank you, Mario, for sharing your passion with the Bay Area! Photos courtesy of Mario Cruz. Sunday afternoons in Chile are made for pastel de choclo, a South American version of shepherd's pie. Chef Miriam Valenzuela, of Restaurant Valparaiso in Albany, says the dish is made in the summer when corn is plentiful and the family is around to help out. Pastel de choclo has three layers. At the bottom is a ground beef and onion mix. That is topped with hard boiled eggs, olives and pieces of cooked chicken. The pie is then topped off with a corn blend. "It's very unique," says Valenzuela. "The base is beef, but when you are eating it, you find chicken. It's a surprise." Iconic Latin Rock musician Carlos Santana and award-winning writer-director Peter Bratt have teamed up to create a powerful new documentary film highlighting the life and achievements of iconic civil rights activist and labor organizer, Dolores Huerta. Both native San Franciscans, Carlos & Peter each have personal history with Dolores, having marched and protested with her for decades. When Santana became inspired to produce a film about this controversial and unknown-to-many activist, he knew Peter was the man he needed to direct. And Peter says that after remembering how protesting alongside Dolores as a young man gave him his first sense of strong cultural pride, he realized he HAD to join this project. Asking her some of the tough personal questions, he soon discovered, "She's not into philosophizing, she just goes out and gets things done." Don't miss this powerful work of art, playing in theaters across the Bay Area now. Video courtesy of PBS Distribution. Amber Gonzales-Vargas of the Latino Community Foundation (LCF, @latinocommfdn) inspires us! "This year I am purposefully discovering what kind of activist I am in all parts of my life. At 15 million strong, California Latinos are a force to be reckoned with. I am calling my Latinx community to take action! We need to make sure that when we look back at this moment in history that the voice of the Latino community was present, loud, and influential." (Latinx is the gender-neutral alternative to Latino and Latina). Amber is the Operations Manager at LCF where she manages the internal wheels of the Foundation. Raised in Stockton, CA to Peruvian parents, Amber believes it is our duty to uplift the generations that follow. She is currently a delegate for District 13 in Stockton and wants to help Latinx millennials discover their full potential. She was essential in LCF's voter registration campaign, "Yo Voy a Votar ¿Y Tú?" (translated as "I will vote, what about you?") and currently manages the internship program hoping to expose young people to a career in philanthropy. Join their network at @LatinoCommFdn. Photo courtesy of @ambersvida. Are you familiar with the historic "Mother of San Francisco," Juana Briones? In the early 1800's, she was one of the first residents of what is now San Francisco (but was then known as Yerba Buena). It is believed that the name Yerba Buena (translated as Good Herb) was actually inspired by a medicinal tea that Juana was renowned for making from the Yerba Buena plant. She became famous among the locals for her healing practices, as well as her success as a land & business owner and for giving sanctuary to sailing seeking to escape their torturous lives on whaling ships. Today there are many plaques honoring her place in California history around the Bay Area, as well as schools and parks bearing her name. Photo courtesy of National Park Service/Point Reyes National Seashore Archives. Victoria's LLS candidate campaign was the first in the U.S. to put the spotlight on the environmental and health concerns related to farmworkers exposed to pesticides, which has been shown to cause fatal blood cancers, including non-Hodgkin-lymphoma (NHL). Due to Victoria's pesticide awareness campaign, she received an anonymous letter from someone who lives near a farm on the San Mateo County coast about contaminated water at the farm where the workers live, deplorable housing conditions, the use of short hoes and the use of pesticides. The case is currently under active investigation by the State of California and San Mateo County officials. Victoria's call to action is to ask every person to contact the U.S. Environmental Protection Agency (EPA) to request that all U.S. farms STOP using these dangerous chemicals that impact the entire community and our food. Contact the EPA, State of California Department of Pesticide Regulation at (916) 445-4300. You can read more about Victoria's work in the September issue of Pacifica Magazine. Victoria is also President and owner of De Alba Communications, a multicultural media relations and PR consultancy firm in San Francisco. She received her Bachelor of Communications from the University of San Francisco. Meet Jaime Villagomez, Chief Financial Officer for the Wikimedia Foundation, the non-profit organization that supports and hosts @Wikipedia and several other Wikimedia sites. He leads a team responsible for fundraising $100 million per year for worldwide campaigns with the goal of continually creating free knowledge. One of the more recent efforts, which falls under a community engagement initiative, is teaching the indigenous populations of Latin America, such as the Bolivian community pictured here, how to create and upload content for Wikipedia. Villagomez, of Mexican descent, is a graduate from the Electrical and Electronics Engineering School, @Stanford University, and received his MBA from The Wharton School (@whartonschool). The next time you use Wikipedia, the free online encyclopedia, consider the financial functions and even a donation to Wikimedia Foundation. Bolivia photos courtesy of Barrioflores. Headshot courtesy of Wikimedia. Sara Lomelin Velten is the Vice President of Philanthropy at the Latino Community Foundation - the only statewide foundation solely focused on investing in Latino families and youth in California. Sara is a connector of people and ideas, and a firm believer that everyone can be a philanthropist. Originally from Mexico City, she has been deeply moved by seeing her "compatriotas" supporting each other after the recent earthquakes. Sara is mobilizing a network of leaders in the US to aid recovery efforts. As the VP of Philanthropy at LCF, Sara has helped build the largest network of Latinx philanthropists in the country! If you wish to stand with Latino families today, join the Latino Community Foundation at www.latinocf.org! Photo courtesy of Masha Chernyak. Two years ago, Diana Otero asked a group of Central American refugees what they needed most. She expected them to say iPads or other electronics. What she heard shocked her. They wanted to play soccer, like they did in the country they left behind. So she organized a soccer tournament for them, and has held one every year since then. Otero is the director of the Refugee and Immigrant Services program at Catholic Charities of San Mateo County. She is in charge of providing legal assistance to some of the estimated 168,000 minors from Central America detained at the U.S. border between 2014 and 2016. Since that soccer tournament, she has organized Christmas parties and seminars to help them assimilate into American life. A small store called Casa de Chocolates (@casadechocolates) opened in Berkeley back in 2012. Founded by chocolatier Amelia Garcia, the award-winning shop blends contemporary styles of chocolate with Latin American culture and sensibilities. Amelia's goal is to introduce customers to the fascinating and complex history of chocolate - originating from people of Mesoamerica who started their love with cacao as far back as 1200 B.C! Check out their gorgeous and delicious chocolate Aztec calendar, pictured here. Committed to sustainability practices, the shop buys their premium chocolate from only Bay Area-based sources, local organics for in-store desserts, as well as single sources from countries throughout Latin America. You can get a taste for yourself at Casa de Chocolates store on Ashby Avenue in Berkeley or you can shop online. Photo courtesy of Casa de Chocolates. Based in San Francisco, Latinos in Finance (@latinosinfinance) is the leading organization of Latino professionals within the finance industry. Our network is composed of over 1,000 members employed by the top financial firms in the industry, spanning various sectors including asset management, real estate, alternative investments and more. We foster career growth opportunities, business relationships, and entry into finance by hosting events where we share our knowledge and networks. Through mentorship, educational events, connections to top finance firms, and student workshops, we work to increase the numbers and impact of Latinos in the finance. Since LIF's founding in 2008, our network has experienced tremendous growth and expanded to include experienced professionals, undergraduate finance students and C-suite executives at the world's leading financial institutions. All students and professionals are encouraged to sign up for our newsletter at latinosinfinance.org. Photos courtesy of Dari Photography. Kids' Vision (@kidsvisionstem) was born when Ana, María Célérier's daughter, shared with her mother that she didn't like math because it was boring. Ana found it boring because she was under the impression that math is all about operations and procedures. María understood how impactful and difficult it could be for a child to grow up thinking about math that way. It was then that María started to read research done on Math Education, particularly Stanford Professors Jo Boaler's and Carol Dweck's (@theofficalcaroldweck) research. Motivated by what the research showed, María tried to find a nonprofit that would show Ana the interesting side of math, while helping her develop an inquisitive mind. María couldn't find it, so she decided to create one herself! Kids' Vision was found in 2013 to empower girls to improve their academic performance, to develop their interest in STEM (Science, Technology, Engineering and Math) and to provide them role models. You can see what Kids' Vision does in a mini video (copy & paste the link): https://youtu.be/x9hbgbsZt04 Photo courtesy of Kids' Vision. Our story is simple, and one we're proud to share. Driven by the family's personal health goals and also the requests of our loyal customers, La Tortilla Factory quickly earned and embraced the title of innovators in the tortilla field-a highly coveted position. We developed the first low carb tortilla, a flexible, gluten free tortilla, and an organic tortilla (way before organic was cool) because we feel very strongly that no one should have to go without tacos. No one. To keep our pledge to better and our innovation game strong, we have assembled a team that continues to find ways to clean up our ingredients statements and make our products even tastier. We've always chosen to be part of the solution rather than the problem so we've begun to nix the bad stuff like dough conditioners, and mono and dyglicier-whats? ?, that may make tortillas easier to produce, but are not exactly items you find in your pantry. Real food. Call us crazy. In fact, we recently refreshed our Hand Made Style line to go non-GMO. These are the things we are proud of. Simply stated, our tortillas are better. Better ingredients, better for you, better tasting, and better for eating on the go. Because we all deserve better! Photo courtesy of Stuart Lirette. Back in 2006, gardening business owner, immigrant success story & father of 2, Catalino Tapia experienced the pride of watching his son graduate from @UCBerkeley Law School. In that moment he recognized that more young Latinos deserved assistance in pursuing a higher education. He started the Bay Area Gardeners Foundation (BAGF) by working with other local gardeners to ask their customers to donate to their efforts. They awarded their very first scholarships to five low-income students that year. To date, they have awarded over 200 scholarships and in 2017 alone they handed out $60,000 in scholarships! Many of the students they assisted have now become professionals and have chosen to give back to their communities, with one former scholarship recipient now serving on BAGF's Board of Directors. Photo courtesy of Jose Aguirre. Club Puertorriqueño de San Francisco is the oldest Latino organization in the United States! Founded way back on February 25, 1912, the Puerto Rican nonprofit and social club is celebrating its 105th Anniversary this year. The group celebrates various cultural traditions and festivities throughout the year for members, their families, and the community. Their Dia de Reyes - or Three Kings' Day - celebration each January is popular with children and families. And Dia del Cuatro - or The Fourth Day - is a highly-anticipated annual event featuring amazing performances by Puerto Rican artists. The club also gives out numerous scholarships every year to deserving students. Congratulations on your 10th Anniversary! Photo courtesy of Club Puertorriqueno. Did you know that today is the 230th Anniversary of the signing of the U.S. Constitution, which happened back on Sept. 17, 1787? In honor of Constitution Day, we thought you'd like to meet Dr. Maria Echaveste, former White House Deputy Chief of Staff and Special Assistant to President Bill Clinton from 1998 - 2002. Maria is now the Policy and Program Development Director at the Chief Justice Earl Warren Institute on Law and Social Policy, a senior fellow at the @UCBerkeleyOfficial Center for Latin American Studies and has built a distinguished career working as a public policy consultant, lecturer, long-time community leader, and corporate attorney. Currently, she also serves on the board of directors of the California Healthcare Foundation, the @LevelPlayingField Institute, and @MiFamiliaVota. Dr. Maria Echaveste is a true inspiration for all of us - in politics, the classroom, the courtroom, and the community! Photo courtesy of Maria Echaveste. Can you hear the music?? Madera Limpia is an amazing group of musicians from Cuba that creates a unique sound by merging Afro-Cuban and traditional music of its native region - changui, nengon, quiriba, and son - with other music genres like rumba, jazz, reggae, and hip-hop. They were the featured performers at the 2016 San Francisco Bay Area Cuban Festival (@sfbacubanfestival), which takes over venues in the Mission District for three days every October. The annual Festival also includes a variety of performances by professional Cuban artists, highlighting the lesser-known aspects of the Latin, Caribbean, Haitian and African influences that are prevalent in the Eastern part of Cuba, as well as community workshops taught by the artists. We can thank CultuCuba, the nonprofit that has spent the past 10 years working in the San Francisco Bay Area to promote cross-cultural exchanges and educate the community about the rich traditions of Cuban culture. They do so through cultural and educational trips to Cuba, dance and percussion classes, special workshops with professional Cuban artists and teachers, and other community events. Don't miss out on this year's festival and start planning for their annual 2-week trip to Cuba in December, which will focus on the music and dance of Cuba. Find more details at www.cultucuba.org. Photo courtesy of Yasel Gonzales Rivera. Isabel Hawkins is a passionate dancer AND an astronomer! She got excited about astronomy growing up in Cordoba, Argentina. She used to sleep outside on hot nights and became fascinated staring at the stars. That curiosity led her to a Ph.D. in astrophysics at UCLA and work on software development for NASA satellites. Now she is dedicated to making science learning fun at the Exploratorium. She is especially excited to teach about the science heritage of Latinos. She has traveled to the Yucatan to observe Maya engineering and astronomy and has been working with the K'iche' in Guatemala who still follow ancestral calendars. Hawkins is heading up an effort at the Exploratorium to provide more resources in Spanish. Most recently she provided Spanish narration for the museum's live webcast on this year's solar eclipse.